We wake up out of our warm cocoons. We roll out of bed hagged and tired, hair disheveled every which way. We stumble toward the bathroom, ready to begin our daily morning ritual. By definition, a ritual is a ceremonial series of acts. But what acts should you be doing? What tools should you be using? To answer these timeless questions, I hereby present a guide that will ensure an attractive appearance to tackle the most challenging days. Don’t use shampoo/conditioner all in one. There is a reason nice brands bottle them separately. Also, while I don’t mind exclusively men’s products, I find women’s products notoriously better for both women and men alike. Don’t wash your hair TOO much. This strips it of the natural oils that it needs to stay healthy. But definitely wash it if you went outside, got sweaty, did manual labor, danced belligerently at a club, etc. Wash your hair every other day or every two days. Shoddily washing body parts and missing over key areas such as foot soles, armpits, your derriere, and your ears. A Loofa. Not aloof at all. Use a body wash that contains salicylic acid or benzoyl peroxide if you breakout on your skin. These products help slough dead skin cells and kill bacteria that can cause breakouts. 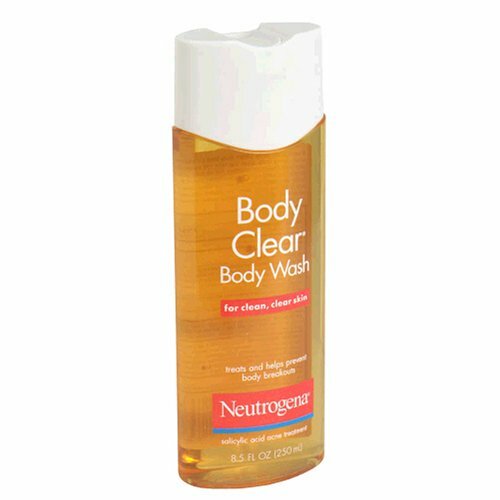 Neutrogena Body Clear Body Wash. Salicylic Acid. Use a mouthwash that can kill the bacteria from the night’s sleep. Listerine Whitening wash works great for this plus helps whiten surface stains. Listerine Whitening Mouth Wash. For those pearly whites. Brush your teeth thoroughly with a FDA approved toothpaste or what 9 out of 10 dentists recommend (Crest, Aquafresh). Thoroughly means washing each side of your teeth’s surface (back, top, front). For the back portion, wash diagonally so that you also brush your gums gently. Washing your face with the same soap you use for your hands. Wash your face with a gentle cleanser (Neutrogena, etc.) that says “noncomodogenic” on the label. This ensures that there are no pore clogging properties in the product. Use a moisturizer after you pat dry. Make sure it includes at least SPF 15 for proper protection from the sun’s rays. Apply an acne cream such as Clearasil on any areas where you have broken out. Use an exfoliator two or three times a week. Use it more often in the summer as your skin gets oilier. This will ensure a nice complexion and scrub dead skin cells off your face. I bet he uses a noncomodogenic wash, SPF moisturizer, and exfoliator. Using cheap, disposable razors. Just don’t do it. Would you rub sandpaper on your face? Using an alcohol based aftershave. It burns, it’s unhealthy, and it stinks. Following a certain order when shaving. Wash your face with hot water. This will open your pores up. Let the cream settle for a bit. Shave WITH the grain. Repeat if needed. Don’t go against the grain, but you can go across the grain if you feel the need to go closer. Shaving with the grain required. Weird, scrunchy face while shaving? Not required. Rub face with cold water. This will close your pores up. Any old time barber who shaves men for a living will swear by the badger brush. It lifts hair off your skin for a cleaner cut and promotes the health of your face skin. Remember to keep the water hot at all times and apply the preshave oil first. Then, lather up with the badger brush and shave as usual. Skincare: Apply a moisturizer to arms and legs if you have dry skin. Underarms: Apply an anti-perspirant AND deodorant. DON’T SKIP THIS. Eyebrows: Tweeze any stray hairs. Yes, I did say tweeze. Shaving will cut hair to the base, where it is at its thickest, giving it a fuller appearance as it grows back. The hair won’t grow back thicker, but tweezing is still better. You don’t see girls shaving their eyebrows for a reason. So make sure your eyebrows are two distinct entities. If they connect in any way, you have a problem. A good rule of thumb is to draw an imaginary line from the ends of your nose up to your eyebrows and destroy anything in the middle. Then, go from the end of your nose diagonally out to the ends of your eyebrows and tweeze anything out of this area. Nails: You should not be able to pick your nose. This is one of the easiest things a man can do – make sure your nails are trim and proper. For the love of all things good and holy in this world, DON’T DO THIS!!! If you do this, you probably shouldn't be reading this. Using hardening gels. Your hair is not an oil slick. Not using any product at all. This will ensure your hair becomes undone after a long day. Using a product that compliments your hair style and look you are going for. Use GROOMING CRÈME/POMADE for: Not so perfect, lived in texture, which gives natural separation, subtle hold. Use WAX for: Natural looking hold and a texturizing effect, with more shine than a pomade. Armani Mania. Anything Armani is Amazing. By following these steps, you will have transformed yourself from a walking zombie into a clean, well-groomed gentlemen. It may (or may not) seem like a lot of things to do, but once you get into the routine, it becomes second nature. It will also become a joy to find and try new luxurious products to better your hair, complexion, and shaving routine. The women in your life will notice a refreshing difference, and you may get compliments on your brightened complexion and fabulous hair style. Go get ‘em, you Fab Man. This entry was posted in Grooming and tagged Grooming, Hair Styling, Manscaping, Shaving. Bookmark the permalink. HAHAH. Just had to have a pic of A.C. Slater – very nice! I have to voice my support for the shaving brush. The Art of Shaving is a great set of products and I highly recommend. Why don’t you just send this in to GQ or some sort of fashion magazine, people need to know!!!! Oh and it’s true about the 2 in 1 shampoos. Definitely leave hair very dry and harsh. And Armani Mania: may be the best cologne….ever.